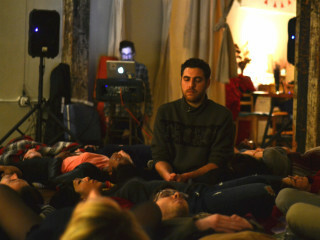 An Immersive Sound Bath is very similar in nature to a traditional sound bath; however, instead of playing instruments such as glass bowls or gongs, the sounds are created within a circle of 8 independent speakers utilizing the infinite possibilities of electronic sounds. With this unique setup, the movement and frequency of the sounds can be controlled on a very precise level using custom software to move sound in a circular pattern. The cyclical nature of the swirling sounds invokes a blissful and peaceful trancelike state unlike any other. Additionally, because the sounds selected are neutral (not from nature or traditional instruments) it enables listeners to become easily immersed in thought and to effortlessly project their own imagery onto the soundscape.